What Has Two Floors, a Waterslide, & Room for 15 People? 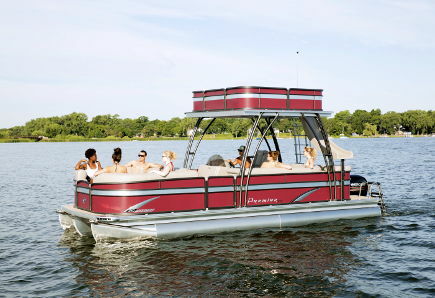 How about a decked-out double-decker pontoon boat! A built in stereo (with subwoofer) and cooler, combined with up to 14 of your friends and family, practically guarantees a good time. Kickin’ Back Boat Rentals Ltd has the one and only double decker pontoon boat with a waterslide in Lake Country for rent. Now, if the idea of splashing around on a 15-person 150HP pontoon boat with a built-in waterslide doesn’t sound like a good time, we don’t know what does. 15 people on the beautiful Okanagan lake sounds like a great time, doesn’t it? 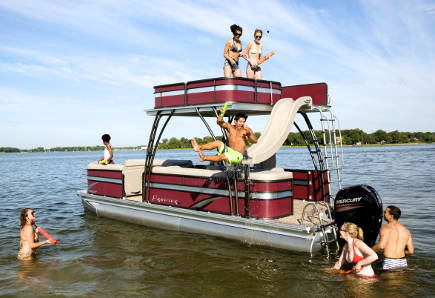 With the Premier Double Decker Pontoon, you’ve got enough grunt to get moving and enough room to party. The Premier Sunsation is a fantastic boat for groups of people that want to hit the open water and have a good time. Keeping in mind that it’s a pontoon boat and not a speedboat (if you want speed, check out the 260HP Four Winns H200 SS), you’ve still got plenty of power with 150HP on tap. The top deck is perfect for those I can’t wait to sunbathe moments. With a blue sky above you and fresh water below you, the only way to make that situation even better is an ice cold drink… which the built in cooler is happy to provide. 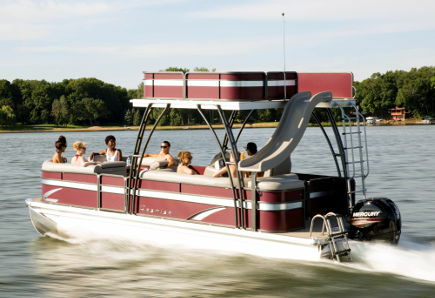 This boat is ideal for a group of people looking to lounge, splash, and enjoy themselves while out on the lake. It can also pull a tube behind it, making it great for families.